Theo DeWine peeks out over the lights. 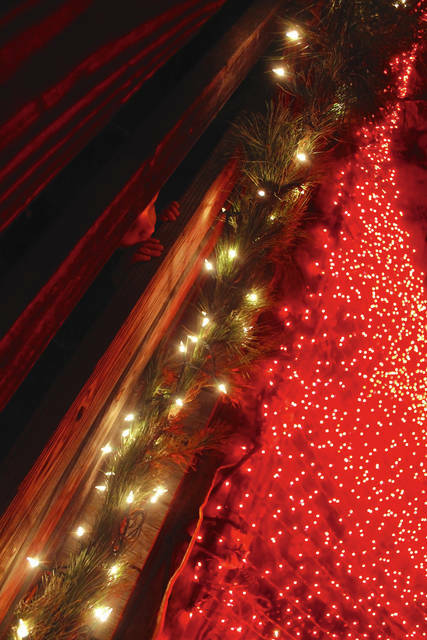 https://www.beavercreeknewscurrent.com/wp-content/uploads/sites/49/2018/11/web1_Bridge2.jpgMore than 4 million lights illuminate the mill and the gorge, including the covered bridge, riverbanks and trees. 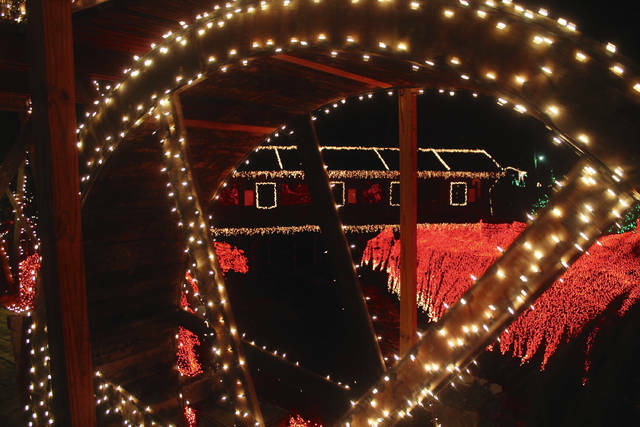 Visitors can see Clifton Mill’s lights every night 6-9 p.m. through Monday, Dec. 31 at 75 Water Street. Gates open nightly 5 p.m. The gates close 8 p.m. on Christmas Eve, Christmas Day and New Year’s Eve. Admission is $10; children 6 and under are free. 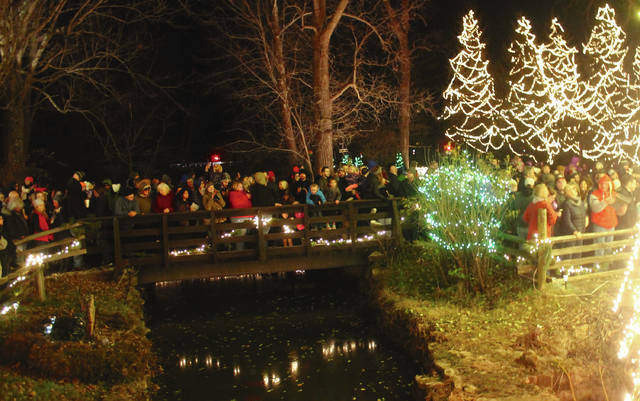 https://www.beavercreeknewscurrent.com/wp-content/uploads/sites/49/2018/11/web1_Crowd.jpgA crowd gathers to watch the lights brighten the Clifton Mill for the first time this Christmas season. https://www.beavercreeknewscurrent.com/wp-content/uploads/sites/49/2018/11/web1_FlipOn.jpgAnna Bolton | Greene County News Governor-Elect Mike DeWine, with his wife, Fran, and grandchildren Theo DeWine, Jeanie Dudukovich, Steven Dudukovich and Grady Dudukovich flip the switch to turn on the lights of the Historic Clifton Mill Nov. 23. Opening night for the Legendary Lights of Clifton Mill is always the day after Thanksgiving. 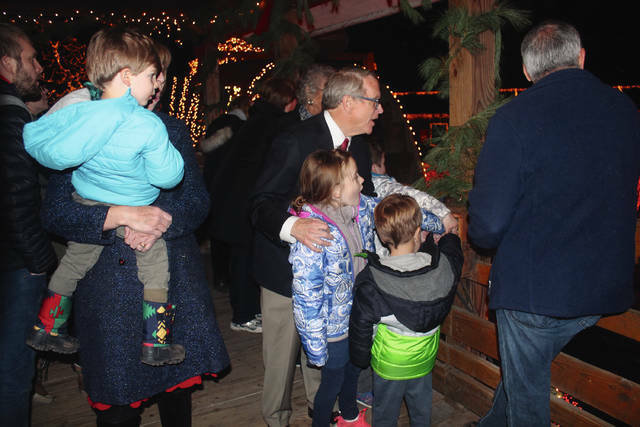 DeWine and his grandmother were the first to turn on the lights 31 years ago. https://www.beavercreeknewscurrent.com/wp-content/uploads/sites/49/2018/11/web1_Peeking.jpgTheo DeWine peeks out over the lights.